Site Updated July 5-6, 2010 to reflect the newest information, as first presented to audiences in July 2010. The original (2002) version of this website is now archived HERE. 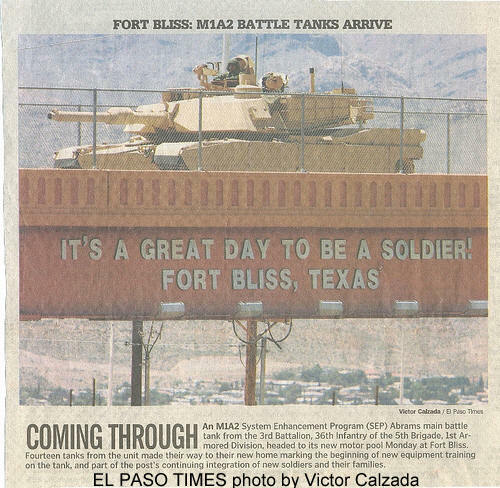 Read all 3 July 1947 Roswell Daily Record in their entirety Souvenir reproductions of RDR Front Page articles at The Roswell Daily Record Online Gift Store. 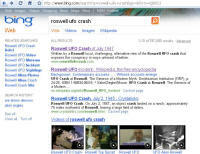 “ROSWELL 1947: When The Mythology Is Stripped Away, What Facts Remain? Lecture originally presented July 2, 2010 at the Roswell Museum & Art Center, as part of The City of Roswell‘s 2010 Roswell 1947 UFO Symposium & July 3, 2010 at The Roswell Public Library as part of the War of The Worlds: The Invisible Battlelecture series. © 2002 & 2010 Guy Malone All Rights Reserved. What I’m sharing with you today is simply a theory of course.. I’m boiling down and introducing you to the research of many other people, based on findings that haven’t been that well-known for very long, which all add up to a very challenging interpretation of the events of July 1947. In a perfect world, you’ll listen objectively to what I’m positing today, and you’ll walk out of here making a personal decision as to whether anything I’ve said here has any real merit or not. 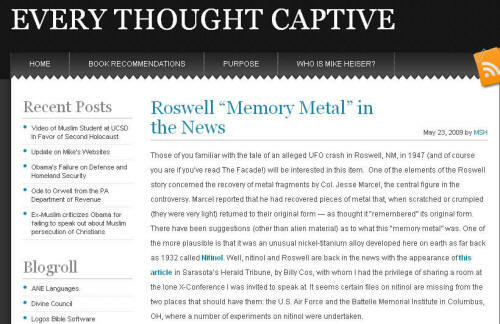 – their “official final word” on the Roswell Incident – has very much resemblance to the truth either. 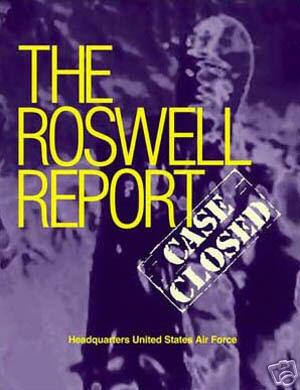 I apologize to any that might be completely unfamiliar with all of these differing versions of official stories the U.S. government has released, but I will say – in complete agreement I think with all of the researchers you’ll have access to in Roswell this weekend – that both the 1947 and 1997 “official” explanations are full of holes enough to be classified as ridiculous fabrications. 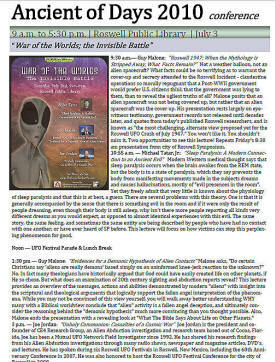 Of the 3 main arguments in the ufology field pertaining to what really happened here all those years ago – the alien hypothesis, the weather balloon hypothesis, and the Top-Secret Mogul balloon hypothesis – if those were the only three possible explanations, I’d say that the alien hypothesis is the one that best fits the factual data pertaining to what we know about July 1947 in fact. 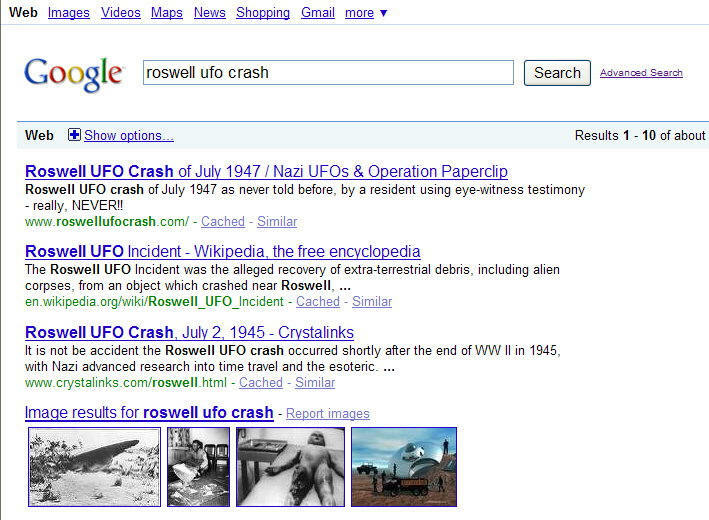 ..or even just “Roswell UFO” my writing on this subject has been the Number 1 or Number 2 match on Google for over 5 years now – constantly battling it out with Wikipedia, which is hard to beat. But you can at least see that a search of that prominence means that this view is becoming influential, to say the least. 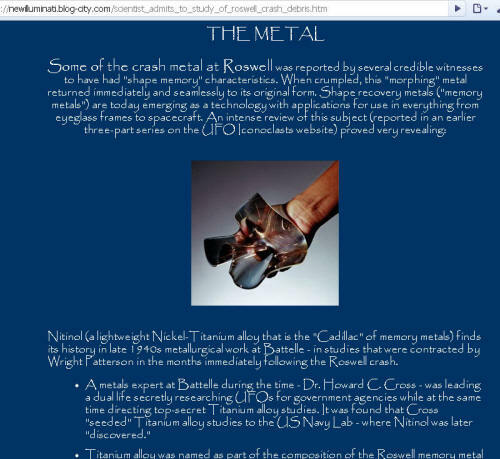 Just like my lecture today, the website starts out with an overview of The Facts, and then what I’ve come to call “The Official Mythology” – the popularized version of The Roswell Incident. The difference is that I’m going to take a crack at shedding some new light on what you likely already believe are “the basics”. I’m not going to be nitpicking these details apart by any means – “debunking” is not my tactic here at all – I’m mainly going to be sharing with you a lot of unknown details about what our government and our military – in highly compartmentalized ways, kind of like The Manhattan Project – were, IN FACT working on in 1947. #1) In July 1947, an unusual craft crashed in the desert of New Mexico. #4) Following orders, the military recanted the flying disk press release hours later, claiming via the next day’s paper that it was just a weather balloon recovered. Problem was, researchers immediately pointed out – I think Stanton Friedman gets the credit for saying this first – that these dummies had not I think even been invented yet in 1947, but that they certainly were not used by the Air Force for ANYTHING until 1953. Which is of course so easy a fact to verify that it’s led many to conclude that not only was the Air Force lying – again – in 1997’s report, but that they wanted people to know they were lying. What I’m positing is that they unofficially – even via the first Press release from 1947 – want people to think the incident was extraterrestrial, to cover up some very ugly truths. What you’re looking at is a group of 104 German Scientists who were moved here, to Fort Bliss Texas and to White Sands Proving Grounds, New Mexico, and who were previously working on some very interesting advanced flying craft prototypes for Adolf Hitler in the closing years and months of World War 2. 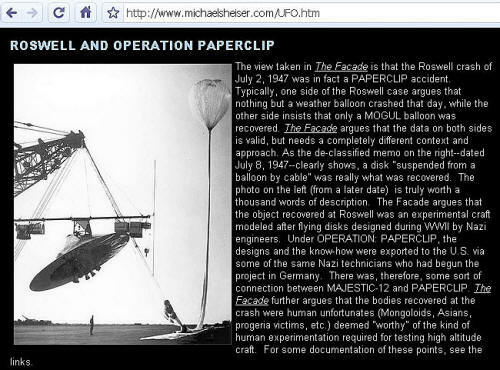 Google “Operation Paperclip” and start with the Wikipedia entry if you already don’t believe me. Among those pictured, is Warner Von Braun, who went on to head NASA’s rocket program and take us to the Moon. Historians now tell us that had Hitler gotten these working flying machines into mass production – photos of which I’ll be sharing here very shortly – before the Allies successfully invaded Germany, that we would have lost the war. …Linda Hunt’s 1991 book Secret Agenda . In the opening page she says “This book would not exist if it were not for the Freedom of Information Act.” Before 911, a LOT of now famous documents have been released to the UFO research field via this act, but Linda Hunt describes in the opening of this book that the government fought her so hard on the documents that she was digging up, that they actually presented her a bill for $239,000 in what they called “search fees”. You think they were trying to scare her off maybe? 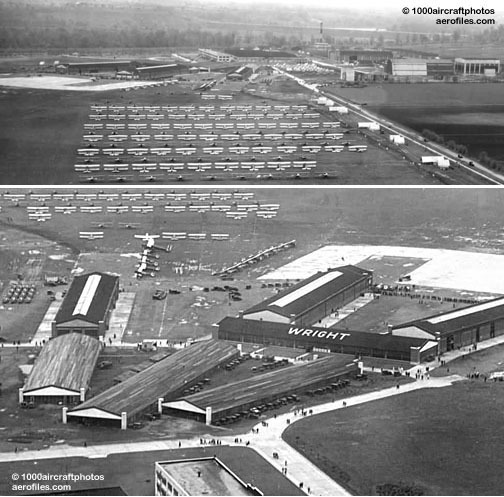 The gist of all this is that when the US and Allied troops were invading all of Hitler’s secret bases in the closing months of the war, they stumbled across such amazing technology that they wanted it. 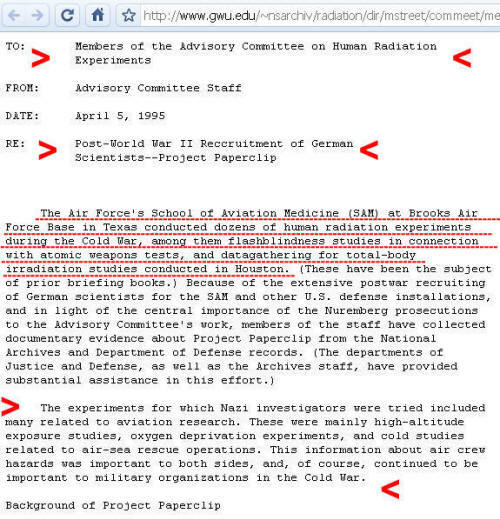 So these scientists were secretly brought into the United States under a media black-out program that “paper-clipped” fake bios on top of their Nazi crimes dossiers, because President Truman was personally against putting certified Nazi criminals on the American payroll. “Truman’s order expressly excluded anyone found “to have been a member of the Nazi Party, and more than a nominal participant in its activities, or an active supporter of Nazi militarism. “menace to the security of the Allied Forces”. 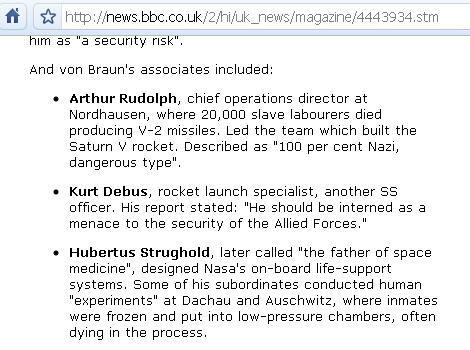 Truman expressly ordered that no real practicing Nazi’s be brought into the US, but had that order been followed, even Wernher von Braun and other important scientists would have been excluded. 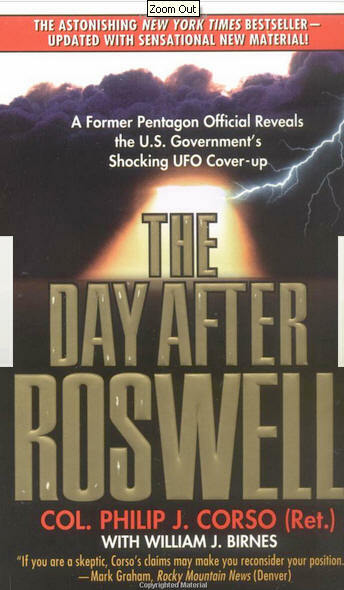 Getting to the relevance of Roswell 1947, I need to first credit Dr Michael S. Heiser, Phd, and his book The Facade for pointing me in this direction of research. Many of you here know his name, as he’s spoken here in Roswell many times as well. I mention him now simply to note that his book was first published in the year 2000, and my site www.RoswellUFOcrash.com went online in 2002, but I’m going to share with you a couple of articles that both went online in November 2005 which sum all of this up very concisely. 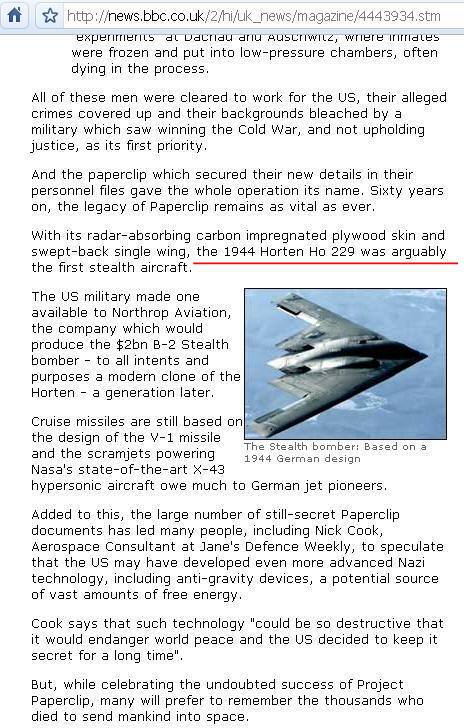 The article mentions some details of von Braun’s associates – also brought into the U.S.
Now I want you to see this picture which the BBC article includes, and take special note of the reference to one of the captured flying craft, The Horten Ho 229, which I’ve underlined in red. 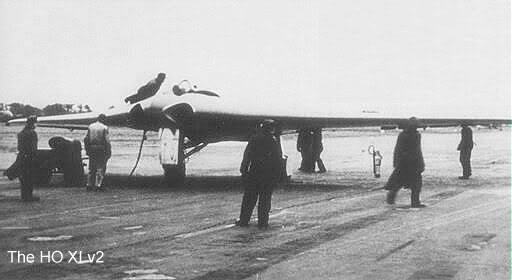 Here is one of the oldest images of the Horten Ho 229, from Germany, 1944. My point is simply to make you ask and answer the question for yourself .. Seeing this, would you argue that the B-2 Bomber that Philip Corso and others believe was reverse-engineered from the Roswell crash, was back-engineered from alien technology – or perhaps from German technology? “…Aviation doctors had suffocated gypsies in pressure chambers and force-fed Jews nothing but seawater for weeks to determine what pilots could withstand. ..suggests that what modern UFO advocates refer to as “The Truth Embargo” to use Stephen Bassett‘s term, or evenRichard Dolan‘s phrase “The National Security State” did NOT begin in 1947 as most people postulate, but rather “THE cover-up of Roswell” actually began right here, in 1945. “The front page of The New York Times on November 17, 1945, bore a curiously vague headline: “88 German Scientists Reach Here, Reputedly With Top War Secrets.” The scientists had arrived on a converted ocean liner the day before—60 years ago today—and been immediately “whisked away” aboard a fleet of buses. “Unusual precautions were taken to keep the arrival secret, and reporters who went on board the ship and found the eighty-eight men waiting to land … were warned away,” the Times reported. The paper speculated that the group’s arrival was the result of a program announced weeks earlier by the War Department to bring German scientists to America, and in spite of the secrecy, the Times guessed right. Men who just seven months earlier had been at war with the United States were being ushered onto our shores by the government. The purpose: to jump-start American high-tech industry. “The Dora concentration camp had supplied slave labor for the Nordhausen missile works, where prisoners had been fed a single piece of bread a day and literally worked to death by the thousands. Aviation doctors had suffocated gypsies in pressure chambers and force-fed Jews nothing but seawater for weeks to determine what pilots could withstand. “The scientists drew little attention from the American press or public until 1957, when the Soviets launched Sputnik. Suddenly all eyes were on our rocket team. The assertion that “their Germans are better than our Germans” (variously attributed to Bob Hope, Lyndon Johnson, and myriad presidential advisers) summed up the public’s attitude at the beginning of the decade-long space race. 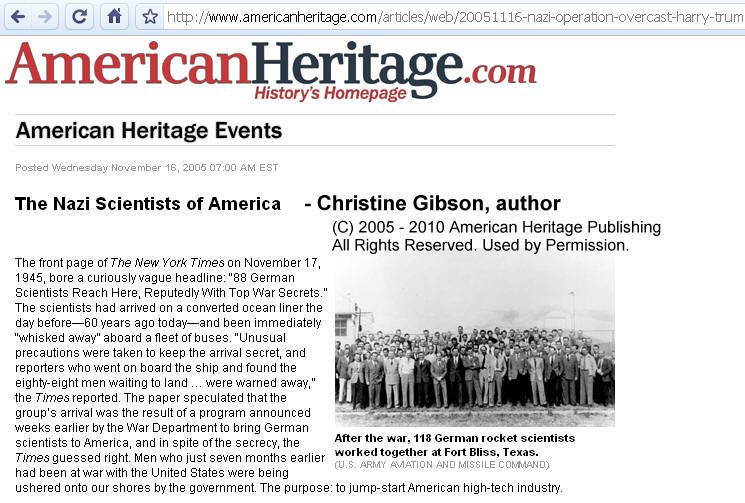 The author Ms Gibson here lays out – beautifully – the rationale for Operation Paperclip, and the fact that these two separate articles came out in November 2005 kind of indicates that whoever controls the press these days is kind of “okay” with the American people finding out about the Nazis working on US soil – 60 years after the fact. But are you beginning to understand now, that under no circumstances could that information be let out in 1947? What if you had just lost two sons fighting the Nazi’s – how would you react in 1947 to finding out they’re living in the United States and eating well on your tax dollars? All that I have just read introduces a topic I’ll be getting back to later… that these Paperclip scientists were not only brilliant when it comes to technology, but were both adept at and willing to perform experiments on human test subjects, specifically, she said, “to determine what pilots could withstand.” I’m just warning you now that this lecture is going to take a very dark turn shortly. Here’s a modern re-creation made for a film documentary. I wish I could cite you the source for this picture, the poster didn’t say anything about it. This is a January 1946 document from Mike Heiser‘s website. 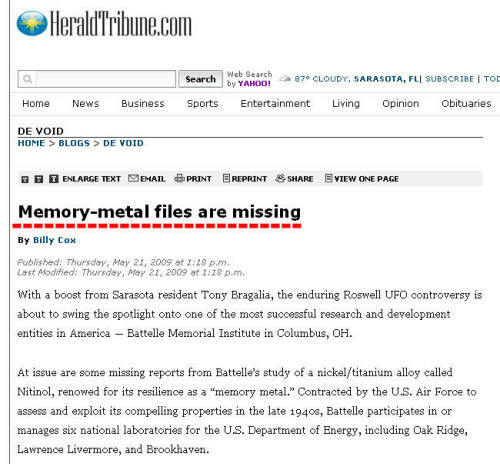 It originates from – of all places – looking at the top right, Wright Field, Dayton Ohio .. Again, the Wright Field connection, where the Roswell debris wound up. I’ve added the red text so you can read the small type of the report’s title – .. It’s unclassified now, but this is the actual cover page of a document that proves the United States “Air Corp” had a working knowledge of the German Flying Wings Designed by the Horten Brothers, and was authorized to begin work on them here in the US. Why is this important for our purposes today? Well for two reasons .. #1 If you didn’t work for Northrop Corporation or for The United States military compartment that brought this aircraft over here from Germany in August 1945 – or if you weren’t privy to Operation Paperclip in the mid-1940’s – odds are, you didn’t know that a craft of this type (or many others which I’ll show you in a moment) even existed, much less had made it to the United States for R&D purposes. Who knows who this is? Which is actually wrong, as many researchers today often point out. Ken Arnold said it skipped “like a saucer” NOT that it looked like a saucer. Okay please keep your eye on the screen real quick here. was really from outer space? 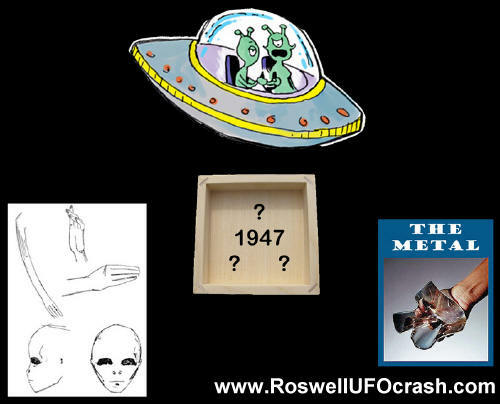 Some people that are really researched on the Roswell Incident already know what I’m about to share, and I think it will interest many of you to know that the craft recovered around the Roswell region in 1947 was not actually round in shape, as you may have pictured in your head due to cartoon artwork or Hollywood renditions. 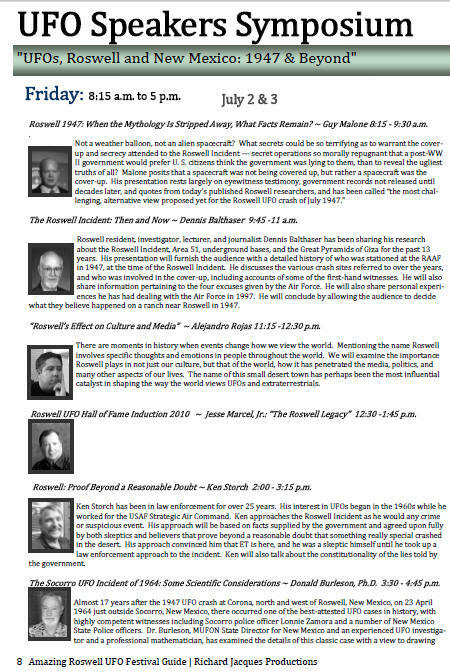 Most of us know that the 2 main books on Roswell that got everybody’s attention were Crash at Corona by Don Berliner and Stanton Friedman of course, who is speaking at the UFO Museum – and The Truth About The UFO Crash at Roswell by Kevin Randle and Don Schmitt. 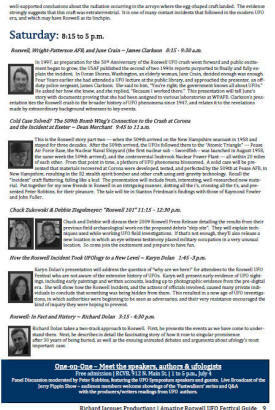 Don Schmitt also speaks at the UFO Museum almost every year, and of course he and Stanton Friedman propose the extra-terrestrial explanation. You may have noticed when you came in the poster I have of drawings by Frank Kaufman, who was at least in the Roswell Army Air Base’s 509th Bomb Squad, and claimed to have been involved in the clean-up of the wreckage, and the bodies. That poster that he drew is his alleged first-hand eye-witness testimony of what he cleaned up, or at least saw, and you may have noticed that the version of the craft he drew is also not round, but more “manta” shaped than circular. 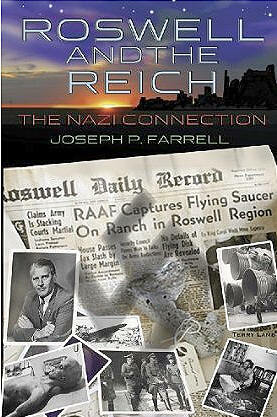 The book “UFO Crash at Roswell” depends largely on Frank Kaufmann’s testimony, and also notes in the caption under Don Schmitt’s drawing based on Kaufmann AND OTHER witnesses’ testimony, that “The craft that crashed at Roswell was long and narrow; it was not a flying saucer.” Altho nowdays Kevin Randle and Don Schmitt have both stated that they no longer affirm Kaufmann’s complete testimony, if any of it, the book based on it is of course still out there influencing young minds today. You’d have to review their newest materials to find that out – But they believed him largely because Walter Haut recommended him. 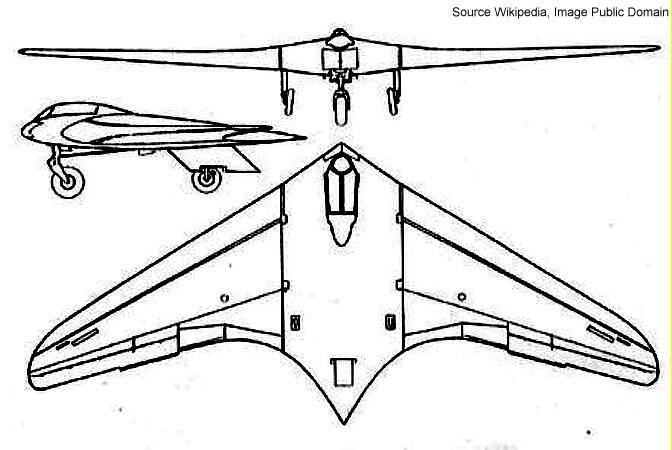 But here are two more of Kaufmann’s drawings of the craft he allegedly saw, published in the book Roswell 1947: I Was There by Robert Shirkey. 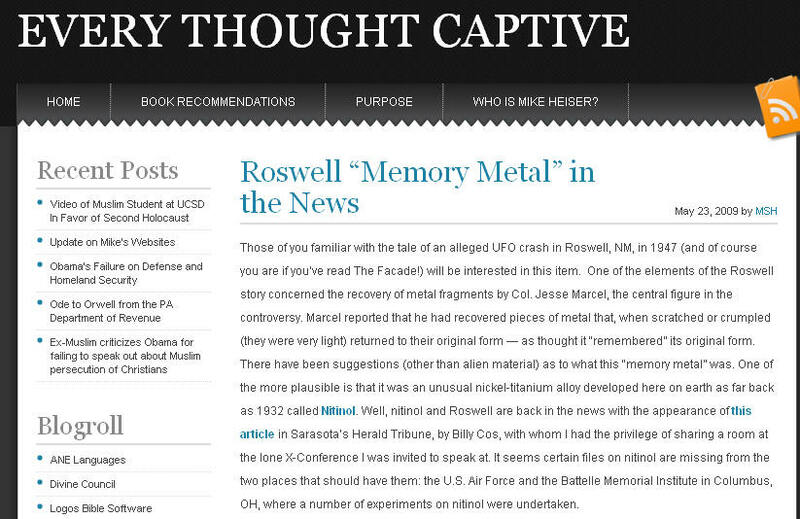 Robert Shirkey is about the ONLY original Roswell witness nobody has successfully debunked by the way. Altho Walter Haut is definitely credible at least in the fact of his original claim that he carried the Roswell press release that is famous world-wide. That much is certainly true. Some of his later quotes and especially the affidavits published after his death do sometimes contradict each other, and his original statements, and many Roswell researchers have detailed those inconsistencies. I’m not going to here. 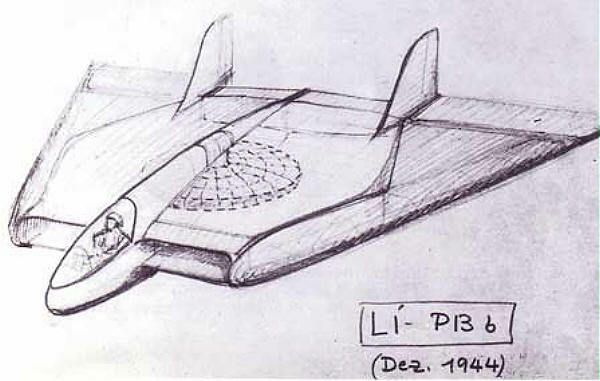 that we only have sketches and models of, because while the Nazis were starting to work on the prototype, the war ended before anyone can verify one was actually built, and then Operation Paperclip grabbed up all the existing sketches, prototypes, and scientists they could relating to these craft. Here’s a modern model of what the Lippisch, if built, would have looked like. 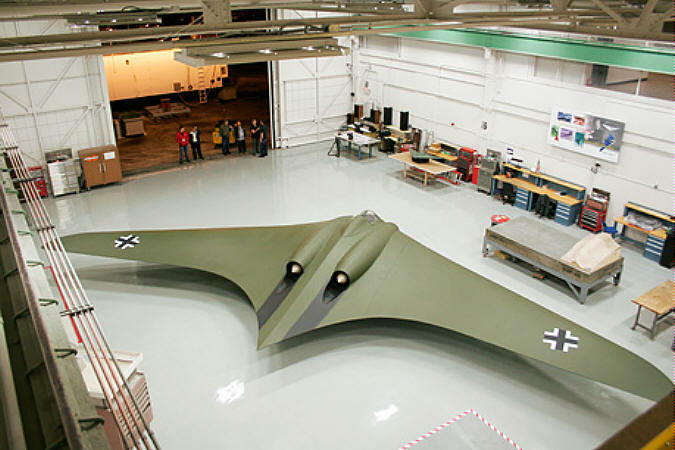 So, German aircraft scientists who were designing and testing both The Horten and arguably The Lippisch were now doing so in the U.S. beginning in 1945. ….So whaddaya think? 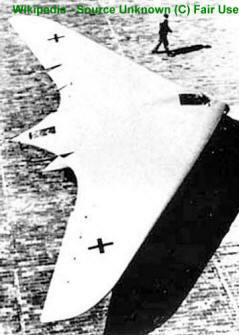 Either it’s reallllly amazing just how close those Germans got in World War 2 to designing ships that look amazingly like extraterrestrial spacecraft from other worlds – OR – perhaps there’s another explanation. Maybe the German scientists who designed the Hortens and The Lippisch in 1944, given 2 years in U.S. secret labs with a blank check from Uncle Sam, maybe developed a spiffier model by July 1947? I think you can see where this lecture is really going by now .. There’s a part of me that really just wants to sit down now, thinking maybe I should just quit while I haven’t really offended anyone, yet, with this man-made explanation of the Roswell craft. But, if I do that, eventually most people will bounce back to questions about “the bodies” and the fantastic metal found at the crash site, right? I certainly did, so, I will be getting to those details soon. Just keep in mind, I have introduced the topic of human experimentation by Nazi war criminals, on American citizens, to this discussion, already, for a reason. This only gets worse folks. If I had time I’d play you some of this interview, but it’s on YouTube, which is where I got this image. 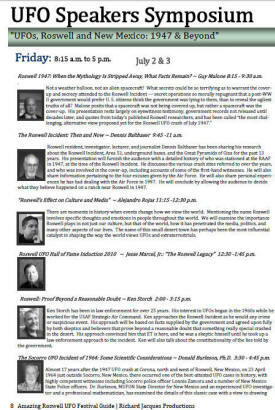 Ian Punnett is now a big advocate of this gentleman’s theories about Roswell by the way. Joseph Farrell posits that the Roswell craft actually originated in Argentina – again, where some of Germany’s scientists wound up. He names 3 of them by name in this interview. The Amazon description continues…) As a prelude to this disappearing act, the SS murdered most of the scientists and technicians involved with the project (which tells you that The U.S. DIDN’T get the ones that worked on The Bell aircraft which was) a secret weapon that, according to one German Nobel prize-winning physicist, was given a classification of decisive for the war — the highest security classification. 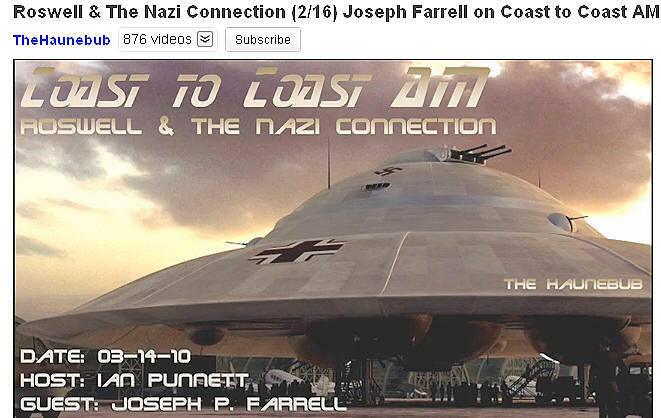 Offered here is a range of exotic technologies the Nazis researched, and challenges to the conventional views of the end of World War Two, the Roswell incident, and the beginning of MAJIC-12, the government’s alleged secret team of UFO investigators. which just came out in February. I only discovered it looking for these other images on Amazon and I haven’t read it yet. And if it turns out he’s right about the Roswell craft originating in Argentina, and I’m partly wrong with what I and others have presented arguing that it possibly coming from the U.S., then so be it – I’m always eager to learn something new and change my mind based on new information. Not everybody is, of course. The point is merely presenting that I think there are valid arguments that the craft recovered in 1947 didn’t come from outer space. So the fact that there was now one on the ground and that perhaps Americans could now finally know the truth and find out what these things were was packed with promise and excitement! However, history tells us that didn’t happen – the public was never permitted to find out the truth behind the Roswell crash – and if the line of reasoning I’m proposing has any resemblance to the truth, perhaps now we’re beginning to see why. The phrase “You can’t handle the truth” does come to mind. 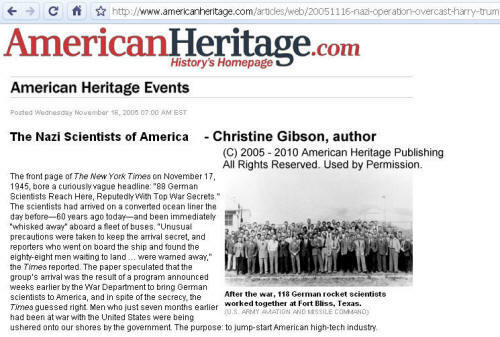 If there’s any Nazi / Operation Paperclip connection to the Roswell Incident at all, I don’t think 1940’s Americana society really wanted to know that we had hundreds of Nazis living here on secret military bases and working for us, to make sure we could defend our new title as undisputed World Champion Superpower … and the President and top military brass sure as heck didn’t want to own up to it either – especially given that the president’s explicit orders were disobeyed and cicumvented by what would become The CIA. I’m suggesting that the moral outrage of that fact getting out in the 1940’s, would have been at least as bad, and divisive an issue to our country, as The Vietnam War was in the 60’s and 70’s. Again, if what I’m suggesting here even resembles the truth, I’d ask you to think for a minute on whether the US government was actually RIGHT in covering it up. It’s of course highly debatable still today whether we even should have brought these guys into the country, but after World War 2 we had the cold war starting up, and all the evidence suggests that The Soviet Union and at least half a dozen other countries WERE recruiting these scientists and taking them and their technology into their borders. Where would we be today, if we had not done the same? We’d be standing on the moral high ground, yes, but we’d probably be a third world country by now as well. Tough call, no matter how you look at it. 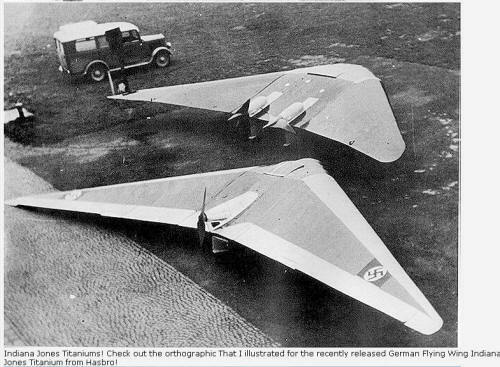 The books I’ve previewed you here hint that there were other types of flying craft being designed by Nazi Germany. I of course can’t major on all of them today, but I would like to show you 3 minutes of a History Channel program just to let your mind go where it will. This is for free viewing on History.com – search Real Nazi UFOs, and I think you can buy the whole documentary. 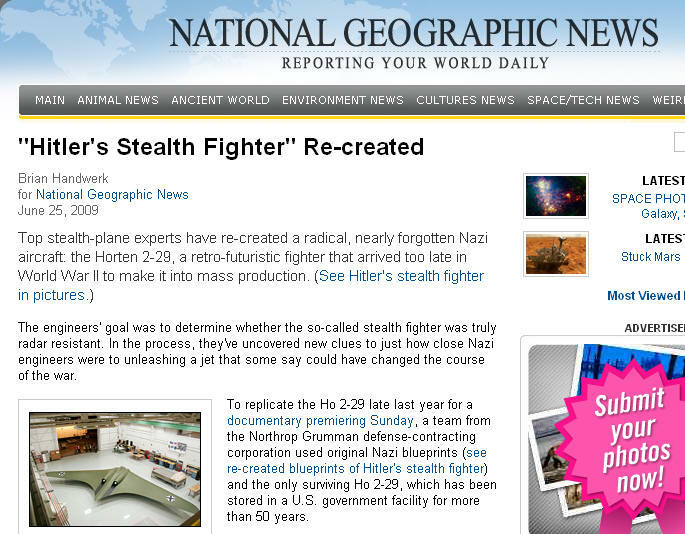 So in closing out the Nazi UFO portion of my website, I summarize it this way. So with this new information in your head, perhaps for the first time for many of you, my question becomes, “Where do you think the craft recovered in 1947 most likely came from?” Mars? Alpha Centauri? The Pleadian Star system? I’m not here to tell you what to think, just to maybe make you think about this topic in a way that you probably never have before. And there’s nothing wrong with that, because most the information that I’ve presented today, wasn’t readily available to you perhaps until just now. Switching gears, the obvious question becomes, “What about the bodies?” I’ll apologize in advance, because I know this is going to offend some of you. That’s not my intent, but getting to the truth is, and I just let the research take me where it would, even though it turned out to be pretty dark. In the previous section on Operation Paperclip, I introduced the ugly fact that human experimentation was part of what the Nazi scientists were guilty of before they came here. Linked from my website, there’s an article on the George Washington University’s National Securities Archive page. irradiation studies conducted in Houston. “I began to ask the question, what protections are in place to prevent such abuses from happening again? What law prohibits experimenting on people without their informed consent? “I find it astounding that even after Nuremberg … we still don’t have a law on our books requiring that informed consent — those two words, `informed consent’–be obtained prior to conducting research on human subjects…. So, relating to Roswell, once you’re not afraid to go where I don’t think many Americans living in 1947 would have even dreamed of, there are definitely a few possible explanations for the reported bodies that have arisen. 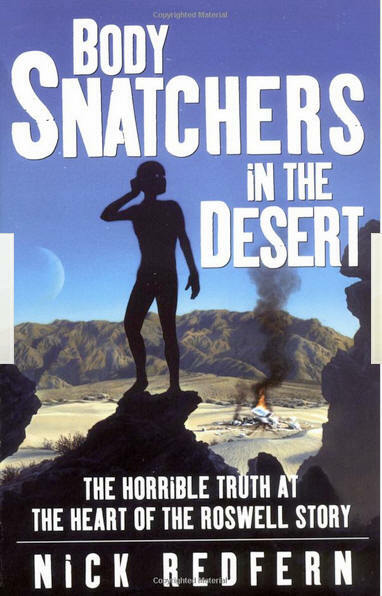 The most well-documented – which I’ll share with you in just a moment – was proposed by well-known UFO researcher Nick Redfern in his 2005 book Body Snatchers in the Desert: The Horrible Truth at the Heart of the Roswell Story . And I learned for the first time, about Progeria. And as I wrote on the website, I hope I’ve never been more wrong in my life. 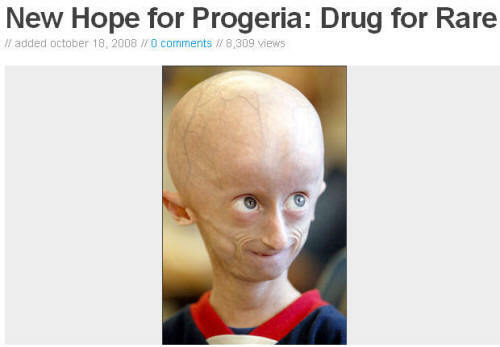 “Children with Progeria usually have these features: dwarf, bald head, pinched nose, large head with a small face, prominent eyes, and wrinkle skin. Nick’s 2005 book in a moment, but first, just to get Dr Michael Heiser back in the picture, as he’s the one that got me started on the Paperclip trail – altho I think I got him started on the progeria trail. PP=== 1. The Japanese Fugo balloon program – – This program involved the use of experimental high altitude balloons as weapons. The goal was to launch these balloons from Japan in such a way as to ensure that they would be carried by the winds over the western United States. The intended payload on these balloons were lethal biotoxins. 9,000 such balloons were launched in the initial phase of the plan, complete with ingenious explosive devices. A few reached U.S. soil, and there were a few casualties. The press wisely obeyed military gag orders on these events, and so the Japanese were kept from ever finding out if their balloon bombs were effective. The nuclear destruction of Hiroshima and Nagasaki brought the war to an end before the Japanese could send the Fugo ballons with bioweapons. Learning about all this has renewed my confidence in our nuclear decision to end the war. PP==== 2. Japan’s Unit 731 – One of the more infamous atrocity mills of WW II. Unit 731 was an officially sanctioned and funded bioweapons program / facility headquartered in Harbin, Manchuria. Headed by Shiro Ishii, Unit 731 has become synonymous with human experimentation for those who know of its existence. Experiments on human beings (or “logs” as they were referred to) involving live human vivisection, effects of frostbite, high altitude pressurization, exposure to bioweapons, flamethrowers, and explosives were routine. These experiments included U.S. POWs. This Unit was the potential source of the bioweapons to be used for the Fugo balloon project. PP==== 3. 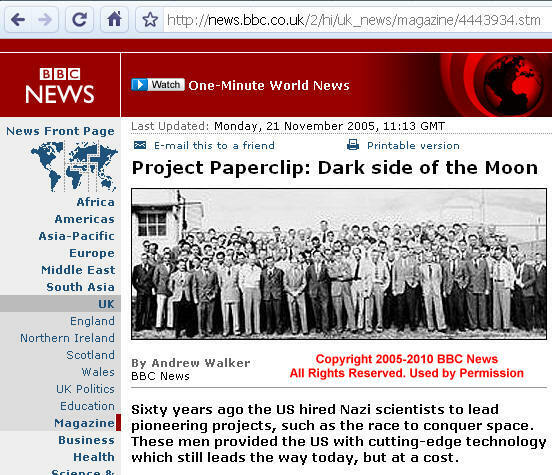 Operation PAPERCLIP – The now well-known program begun under the Truman administration to bring Nazi scientists to U.S. soil for their knowledge and expertise. As Nick demonstrates, the program eventually included Japanese scientists. However, even prior to the “heyday” of PAPERCLIP, the U.S. government, with the approval of Douglas MacArthur, was soliciting and procuring Unit 731 scientists for their advanced knowledge of bioweapons and their effect on human beings. Nick marshals brief, but weighty, evidence that both Nazis and Unit 731 scientists who engaged in human experimentation made it into this country and wound up on the U.S. payroll. PP=== 4. Nazi Advanced Wingless Aircraft / the Horten Brothers “UFO” Development – This refers to the work of Reimer and Walter Horten, mainly toward the end of the war, to produce a flight-worthy wingless disk aircraft. 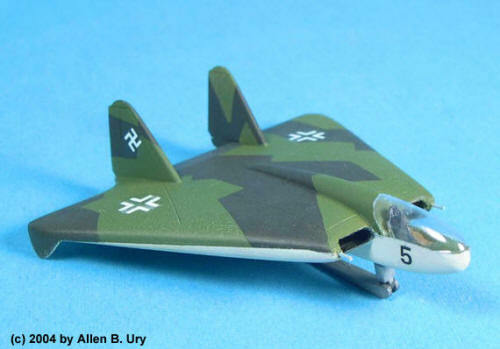 Although models were tested and commissioned by the Luftwaffe in 1944-45, the war ended before the Nazis could more perfectly develop and mass produce the model. 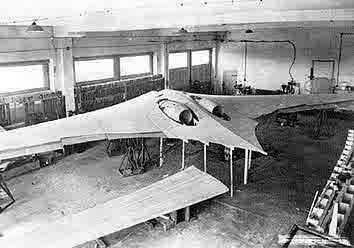 The Horten craft was discovered by the British, after which the Horten brothers were invited to Britain to continue their work. An agreement between the two and Britain could not be reached, and the Hortens returned to Germany in 1945. PP === 5. NEPA (Nuclear Energy for Propulsion Aircraft) – This program focused on developing nuclear energy for the propulsion of aircraft. One of the significant obstacles with achieving the project goal was shielding pilots from radiation. Another problem was constructing a reactor light enough and small enough for an aircraft. A sub-problem for the testing involving the protection of occupants from radiation was that, eventually, human occupants would have to be put at risk. Redfern argues that, in the wake of the 1947 close of the Nuremberg trials—which called for the end of human experimentation—those involved in our testing program felt rushed to gain official permission to use human subjects. Attempts were made to procure legislation allowing human experimentation. Documentation indicates that, eventually, prisoners and mental patients from U.S jails and institutions were used, along with dead bodies snatched from morgues and hospitals without consent of surviving kin. This body snatching program was dubbed Project Sunshine. Of particular relevance for Redfern’s thesis is the documentary evidence that certain “specimens” were procured from Formosa, home of Unit 731.
pp=== “The intersection of all the above offered by Redfern can be briefly described as follows. 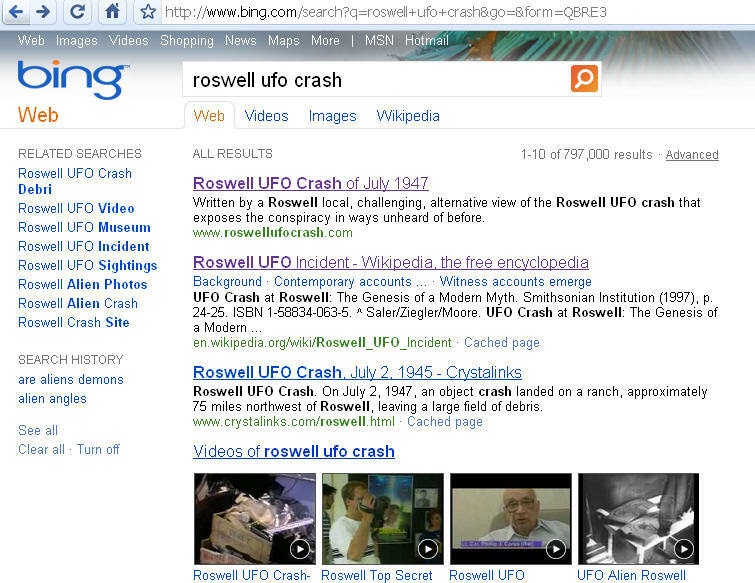 Roswell was a PAPERCLIP screw-up. The “UFO” was in reality a wingless craft launched from a U.S. base in the southwest via a high altitude Fugo balloon. These craft were occupied by either a Japanese crew (no one over five feet tall) or human unfortunates being utilized for testing purposes. Two or more of these craft crashed at Roswell and other nearby locations, explaining the multiple site / multiple date problem pointed to by skeptics as conflicting (and therefore unreliable) testimony. The bodies were human, but physically unusual to those who discovered them. The victims were small, perhaps oriental, or perhaps unfortunates who suffered from progeria or Turner’s syndrome (which involved baldness, enlarged head, and even polydactylism). The UFO explanation was floated to the public to deflect attention away from the fact that Nazis and other Japanese war criminals were on our payroll. After the late forties, the UFO scenario proved useful for misdirecting the Soviets, and so the myth was continued. pp=== Redfern supports this reconstruction in a twofold way: actual de-classified documents and clandestine sources. My only criticism of the book pertains to a small point about the documentation, so I mention it here before proceeding. I would have liked to see Redfern give more details as to where he got the documentary evidence. That annoyance aside, in my view, he does a good job in laying out the details of the above reconstruction from his inside sources, and then proceeds to systematically corroborate data points with physical (documentary) evidence. 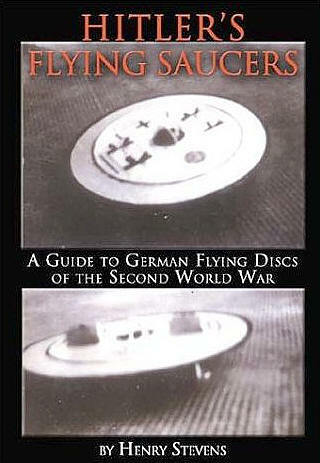 For example, his book contains documentation for the adaptation of the Fugo program at U.S. military facilities (including a Japanese crew), a far-reaching program of radiation testing involving U.S. citizens as guinea pigs, procurement of Japanese war criminals from Unit 731 under PAPERCLIP,and human experimentation involving the handicapped, retarded, children, dwarfs, and victims of progeria. Redfern also adds some startling correlative evidence to support his reconstruction. For example, Dr. Lincoln Lapaz, long suspected to have been involved in the Roswell incident because of witness testimony, was actually the leading U.S. expert on Fugo balloons. 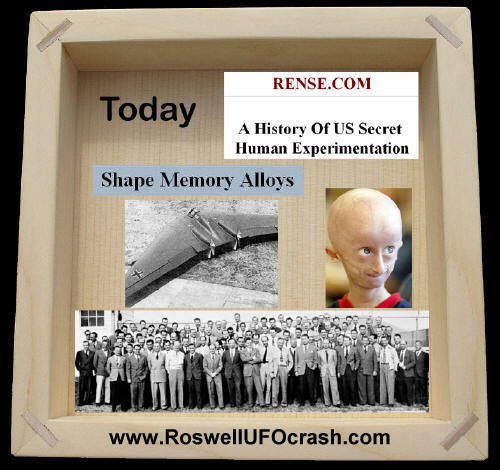 There are of course others, even down to how theseexperimental programs were utilizing exotic materials that account for some of the more dramatic Roswell testimony—like metal that “remembered” its original shape. Space prevents more than passing mention of the details of such details. Re the whole Japanese angle: several people have said to me (old-timers) have said that part of the secret of where the people came from is a place called Fort Stanton. Do a Google on Fort Stanton, New Mexico and take a good look at its history, which includes keeping both handicapped people there AND Japanese people during the war. And, it’s just down the road (in aviation terms) from where the debris was found in Lincoln County at the ranch. Fort Stanton has a curious and intriguing history which definitely deserves looking at deeper. Mike ends with / goes on to continue with a very fair assessment of Stanton Friedman’s review of Nick’s book – which you can probably guess was less than favorable. Mike charitably points out that it’s fair that someone who has invested so many years of his life into promoting one view would indeed need a little more documentation than Nick provided to completely overturn Friedman’s alien view of course. But what about you? 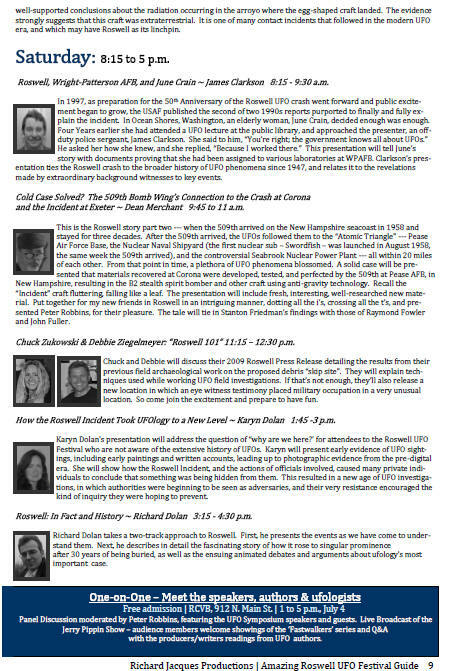 Not everybody is as ardent in their belief that aliens crashed here as Stanton Friedman is, and quite honestly, I’m considering my target audience for this lecture the “undecided” category, not so much the true believers. I think it’s a cinch that the craft can be argued as an earth-made vehicle… But let me read to you in Nick’s words some documentation regarding the types of humans who – in general – were being experimented on in 1947 by the U.S. government. The only images you’ve probably ever been exposed to of the “Roswell bodies” were based on something drawn third-hand, 46 years after the fact. This 1991 drawing accompanies Glenn Dennis’ affidavit of his participation in the Roswell Incident. At age 65, he is remembering what he claims an unidentified nurse drew for him, and Walter Henn drew these sketches based on what Glenn Dennis said he remembered in 1991of this unidentified nurse’s 1947 sketch, which he says he lost. Drawn third hand, 46 years later, that singular, debatable, image is the major source of almost all “Roswell Bodies” stories that you’ve most likely ever heard. 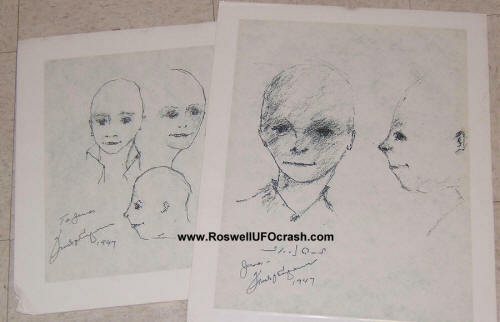 These images don’t look particularly alien, I’d submit to you, but I also submit that no drawings of the alleged bodies are considered reliable by the majority of any published Roswell researchers. All we know is that they are pretty universally said to have large heads, and big eyes, and child-sized bodies. Something like this, I’m afraid. I’m not going to cue this video by the way, don’t worry. 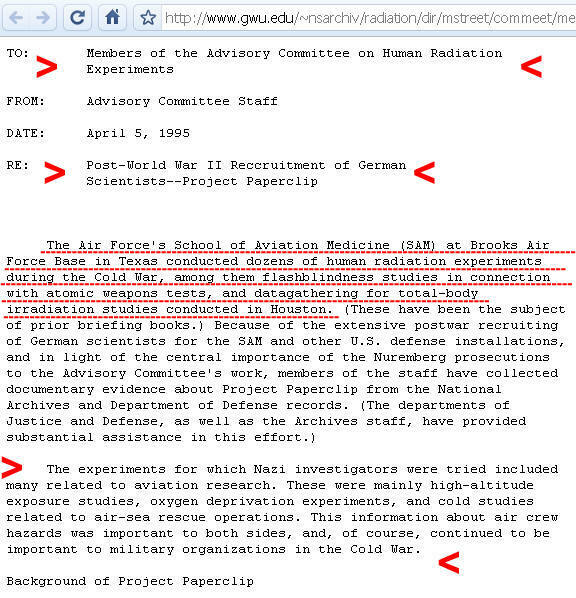 But, knowing that high-altitude and radiation tests were among the exact human experimentation tests being run all through the 1940’s, AND that disfigured and so-called “undesirables” were among the favorite victims of such… with what you know today about what different world governments have done in the name of “science” and “research” – including the factor of employing Nazi scientists to carry out the dirty work… I’m simply posing the question to you, “Would you put it past them, to have put someone like this into an experimental craft, just to see what the effects on the human body would be of perhaps never before achieved altitudes and speeds? 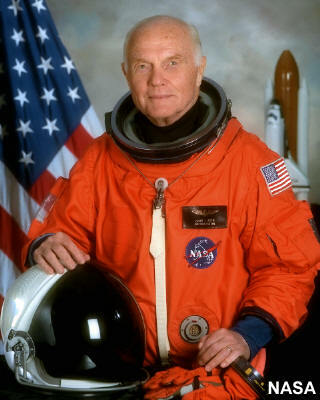 Or, “Would you put it past our government – now or then – to use someone like this to find out how much radiation a human body could safely absorb, assuming they’re flying a craft with a brand-new, untested nuclear powered engine or something?” Why risk losing Chuck Yaegar when people like this are available, and allegedly expendable? I’m sorry, I know this is supposed to be a festival, and this line of thought isn’t very festive, I realize. But if what I’m sharing here today is anything close to the truth, it does kinda raise the question tho, what exactly are we “celebrating” in the first place? 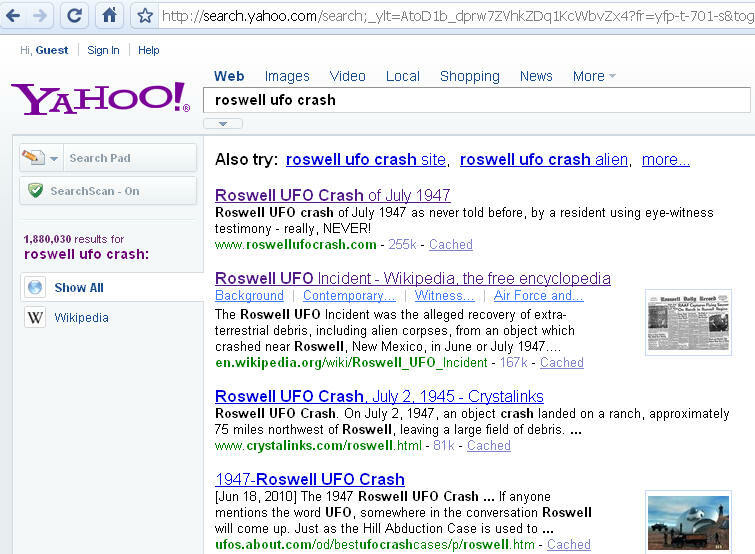 “Is aliens the only possible explanation for any dead or dying bodies that might have been found at the 1947 crash site?” I’m sorry and kind of sick to my stomach to have to report to you that the answer is patently “No.” There was a cold war going on, and apparently both sides felt that it had to be won at any cost. 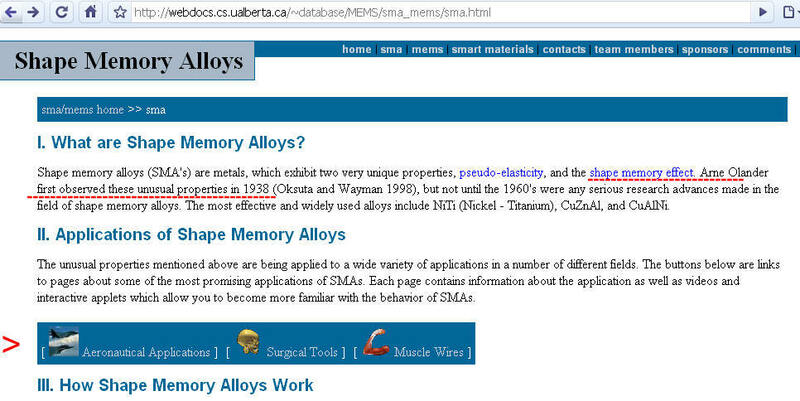 The “memory metal” that as many know, was described as being very tough, but if crumpled or bent would go back to it’s original shape, and there was absolutely nothing like that that was known to exist at the time, right? …Right? 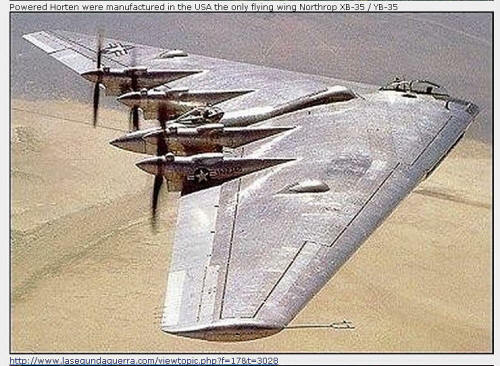 There’s much talk about all the marvels that were allegedly back-engineered from the Roswell crash – like the Stealth Bombers for instance, but we now know that was not the case actually. “It was alien technology that we used: lasers, accelerated particle-beam weapons, and aircraft equipped with “Stealth” features. Now to be clear, I’m not saying that Colonel Corso was lying – I believe that he believed what he was telling in his book was true to the best of his knowledge. 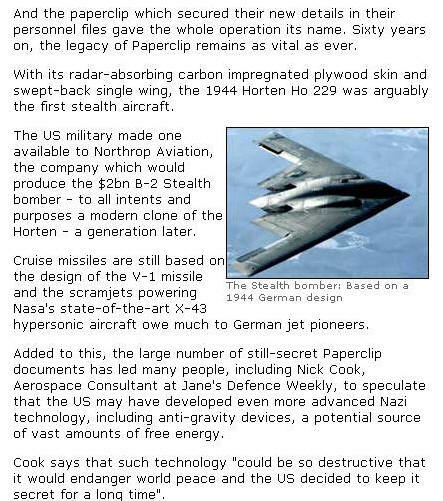 But whoever told him that our Stealth technology was back-engineered from an alien craft – or whoever told the person above him even – or whoever created the famous files and filing cabinet that Corso was put in charge of, possibly was lying. “But why would someone in the government do that to our military, or those under themselves?” we might ask. Colonel Corso actually suggests an answer for that question himself – paragraph 3 of the Introduction – telling us that even before his involvement with the Roswell files, he knew “a terrible secret” – that quote, “…some of our government’s most revered institutions had been penetrated by the KGB.” Colonel Corso himself testified to this in 1962 he says, and made a personal effort to get that information to the President Kennedy, via his brother. And in fact, Tom Bower and Linda Hunt both point out in their books on Operation Paperclip that Lt Col William Henry Whalen, who was running Operation Paperclip, was convicted in 1962 of, quote “selling American defense secrets to Soviet Union.” He is the highest ranking American military officer to ever be convicted of espionage, in fact – the guy that ran Paperclip – in 1962. And here’s how intelligence and counter-intelligence sometimes work when they suspect that have moles, and the CIA or top military officials are trying to find out who to go after. You give one person some “Top Secret” intelligence data or experimental technology and tell them it’s of Russian origin smuggled out by our spies. You give someone else the same information, and tell them it’s created from Tesla technology. You tell someone else it’s from an extra-terrestrial craft, for instance, and tell someone else Westinghouse invented it and the government seized it and bought it from them under the military application law. NONE of these stories are perhaps true, but you create the documentation and give it to 4 different people. Then you wait to see which fabrication makes it’s way to the Soviets… and you know who your mole is. Embedded from You-Tube. If it doesn’t load, please notify me guymalone at gmail.com – Thanks! “Nitinol alloys exhibit shape memory AND superelasticity. Shape memory refers to recovering the metal’s original un-deformed shape upon heating. Superelasticity however, “occurs at a narrow temperature range” and – get this – “NO HEATING is necessary to cause the un-deformed shape to recover.” So, we ask, exactly how long has this stuff been around? This source says these properties were first observed in 1938, BUT also says no “serious research advances” were made until the 1960’s. 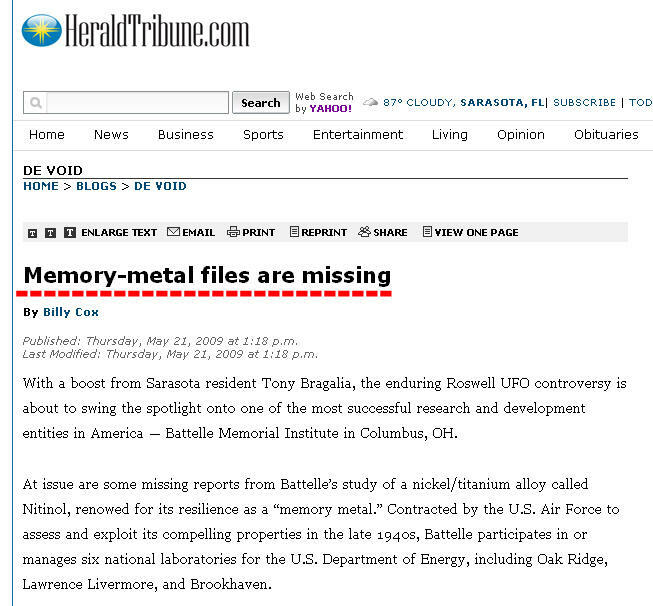 And again I’m going to suggest “none that WE know of.” But hopefully you can see already that if we had aircraft flying around the U.S. that the general military, much less the general public, had no clue existed, how much of a stretch is it to wonder if the “memory metals” first discovered in the 1930’s, might be making it into experimental crafts of the late 1940’s? After all that’s a full decade to have U.S. and later German scientists given access to the initial findings, and secret laboratories to work in and develop them. Nowdays we know it’s pretty normal that any new discoveries or inventions that might have potential military applications are kept out of the realm of public knowledge until decades after the military has had first crack at maximizing the possibilities, before they’re “seeded” into mainstream technology. The metal from the 1947 Roswell Incident was reported by Jesee Marcel Sr and Jr to be unlike anything known at the time, which usually leads to the explanation “Well then it must be from outer space.” Perhaps that’s a further leap in logic than is actually necessary however, knowing now, that memory metals were first discovered in the 1930’s. To finally close this out… In 1947 the general public and most of the military knew absolutely nothing about the exotic flying crafts the Germans had invented, or that the American government had in our possession and was working to replicate – and improve upon before the Russians could do so, and come over here and wipe us off the map. 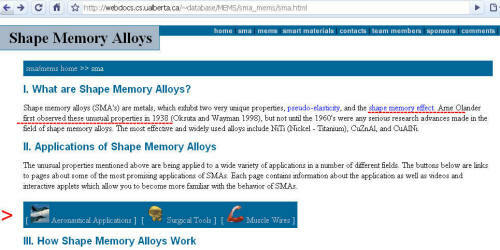 1947 Americana citizens also knew nothing about the 1930’s discovery of Memory Metals. In fact most of you probably didn’t until today – even tho, if you wear eye-glasses – there could be some in your frames. And especially in 1947, American citizens would not have believed or even wanted to know that our own government was even remotely capable of FATALLY experimenting on its own citizens, for ANY reason. The possibility of such well-documented – now – atrocities didn’t even enter their minds. Of course it wouldn’t – we were the good guys, remember? So when the Roswell Incident happened in 1947, none of what I’ve shared with you today was even remotely within the realm possibility to consider when faced with the facts 1947 witnesses had at hand. ALL people knew for 50 years was that an exotic ship made of an unheard-of type of metal, with strange bodies dying everywhere around it, crashed in the desert here, and that the government enforced a cover-up of never-before heard of proportions. You need to know that polls from the 1940’s and 50’s – unlike today – show that not 1 in 10 people believed life on other planets even existed, much less was visiting earth, like three-quarters plus believe today, according to polls. It took some pretty courageous people, thinking really outside the box, to even go on record as considering that the Roswell wreckage might be from another world. Anybody willing to think outside the box on this event for even the first 50 years of the cover-up, has always done so at the risk and personal expense of extensive ridicule – especially from their peers and family. The witnesses who have come forward over the decades and the researchers who have affiliated their good names with these stories are to be commended for their courage, in most cases, I’d say. But I’m also finally suggesting that this proverbial box that people have been thinking outside of all this time, is today much larger than we ever previously thought. I want you to consider, that if everything we’ve discussed today WAS public knowledge in 1947, and the news got out that our government recovered a crashed flying saucer in the New Mexico desert and covered it up for some reason .. what do you think most people would have thought, then, if all this we’ve learned today were public knowledge in 1947? 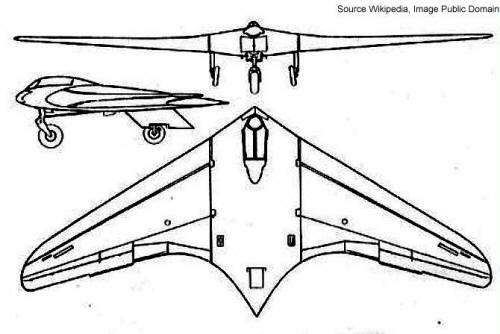 Perhaps something like “Oh it’s just another one of those Stealthy Horten/Lippisch spin-off thingies they’re working on over in White Sands to fight the Commies – Hope nobody got hurt.” “What kind of “legs” do you think the alien theory would have gotten over the last 6 and a half decades IF the average American in 1947 knew about Operation Paperclip, or the fantastic Nazi flying machines? 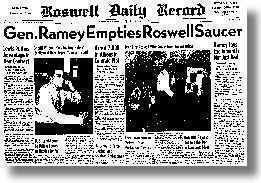 Because the main strength behind the alien hypothesis of the 1947 Roswell Incident is not ANYTHING resembling PROOF of extraterrestrial activity, but has instead always been the belief that there’s just simply “no other explanation” for the reported and undisputable facts, and extremely credible witness testimony. I am gently, and humbly I hope, confronting that belief system today, and asking you to re-think the entire event yourself also, based on the preponderance of evidence made available to us all only very recently. 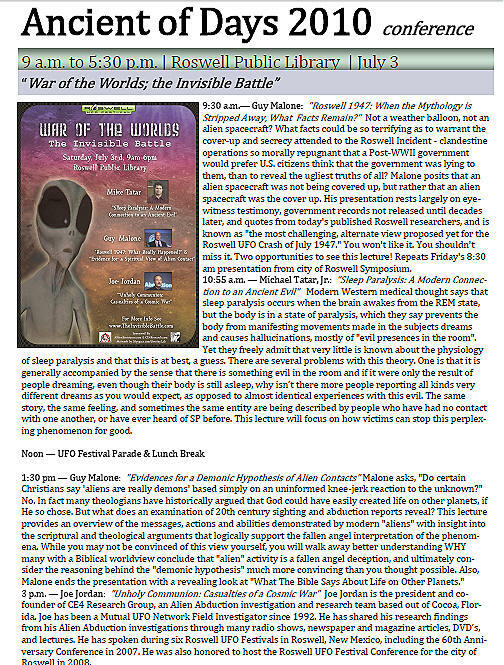 I am today presenting to you that there are in fact many other possible explanations for all of the reported details of The Roswell Incident, and suggesting that it’s time for us all to re-think what we think we know about this event. Please note that all comments may be posted and/or responded to on this site, unless you are sharing information regarding The Roswell Incident and specifically request confidentiality. Please contact me via guymalone at gmail.com with your thoughts.